Submissions are closed and our judges are working through their assigned entries. We would like to take the time to deeply thank the IMMENSE community support, that allows us to not only to facilitate, but also grow Bleedingham into a comprehensive festival event for both the filmmaker and horror fan alike. The judges donate their time to critically look at the works of our entrants, the community film crews help us shoot promos, our friends who donate their skills, gifts and talents, the business community that makes our festival an unique experience full of amazing prizes from local business for attendees, and of course the core, the filmmakers and the Horror fans. Without these components, Bleedingham would simply not be possible. Bleedingham creates a space for filmmakers to screen their work among their peers while receiving critical feedback on their films from an extensive panel of judges who have backgrounds in various aspects of the creative community at large. This year Bleedingham has grown a little again! Our family at the Pickford Film Center has given us additional screen time at it’s sister theatre, The Limelight Cinema. This allows us to screen more films and accept more categories. With events like The Night Gallery, Filmmakers Brunch, and Horror Trivia at Aslan Brewing, this year we have a packed schedule of delightfully ghoulish activities for the 2018 Bleedingham weekend. The Night Gallery! So to kick off Bleedingham, we have gathered macabre and dark artists, performers, vendors, bands, Tarot readers, ghost hunting teams, food vendors and beer from Aslan to create a spooky Halloween celebration for all to enjoy! 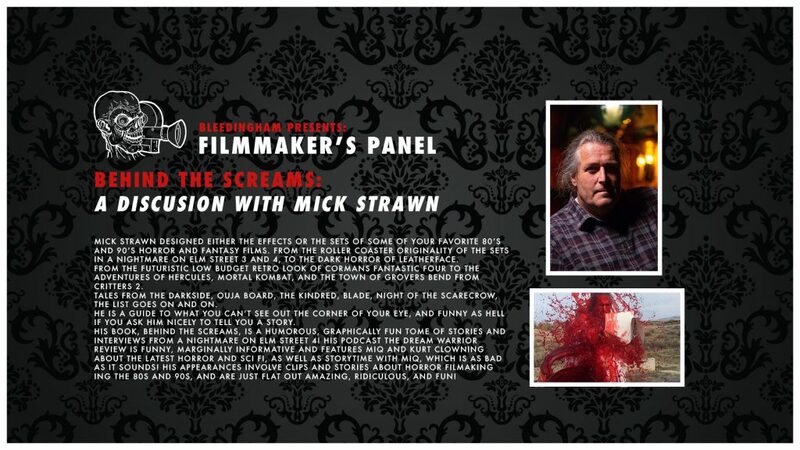 We feature panels that are related to filmmaking and horror every year as well. This year we’ve partnered with Bellingham Film to host their monthly mixer! This is great chance to mingle and meet with more of the local filmmaking community. Livetaping of THE BONUS MATERIAL podcast with Langley West and Thom Carnell! This should be quite the treat for those who would love more insight into horror film from both the cinephile and the filmmaker perspective. Warm up for the evening event with a creepy, fun collection of Macabre shorts, animations, music videos and more. Featuring Glen Bristow as our host with the most! cupcakes from Pure Bliss Desserts and an awesome deli platter provided by Old World Deli! This is our core event! 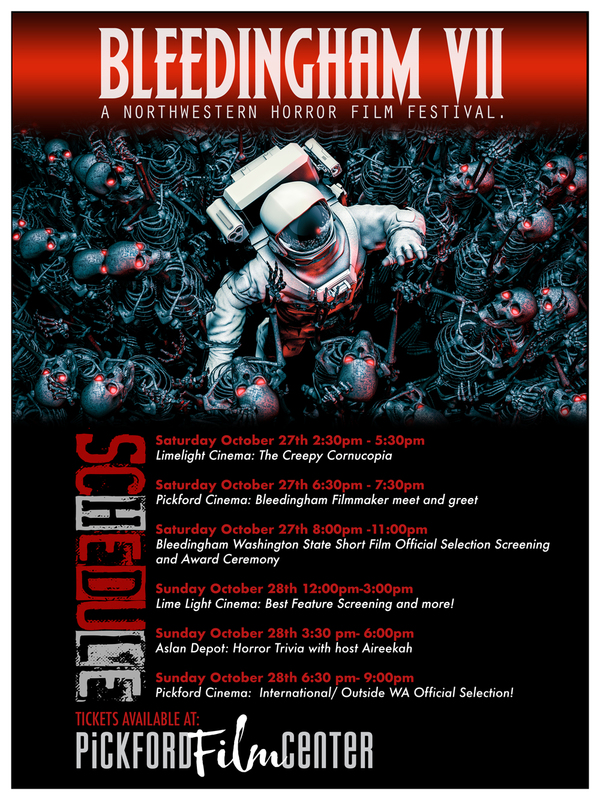 Filmmakers and horror fans will gather from all over WA state to screen the top local short films based on our judge’s scores! Hosted by Festival director Langley West and Jackie Kersten, this will be a night of audience prizes and horror shenanigans! Lime Light Cinema: Best Feature Screening and more! Join us Sunday at Noon for the screening of “Best Feature” and possibly more content depending on the length of the winning film! Engage in some festive horror trivia with other filmmakers and horror fans at the wonderful Aslan Depot! Pickford Cinema: International/ Outside WA Official Selection! This is our final screening, horror fans and filmmakers DO NOT MISS OUT on this block. and the content is terrifying! You will definitely want to check this block out as these films are AMAZING! Also featuring curated local selections! Tickets should go on sale this week and we will update this article with links when available. This year we are offering weekend passes for $25 as well! Once tickets go on sale you can pick your weekend passes up at Pickford Film Center. If you have any questions or inquiries, you can email us Bleedinghamfilmfest@gmail.com or reach out via one of our social media outlets. Whether you are a horror fan or filmmaker, we hope you will join us this year as we celebrate the art of Macabre Storytelling and the people that make that happen! ← Bleedingham 2016 will be taking place at the Pickford Film Center.